Water features are the perfect way to enhance the serenity and tranquility to your outdoor-living space. The soothing sounds of rushing water emanating from your custom fountain, waterfall, or koi pond will transform your back yard into your own private getaway where you can relax and unwind. 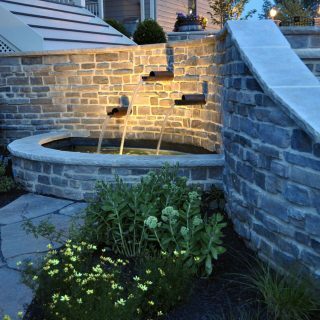 Serving the greater Washington, DC and Baltimore areas, Clearwater Landscape & Nursery is capable of custom designing and building all types of water features. Our team specializes in seamlessly integrating your water feature into your custom landscaping and hardscape for designs that truly flow and the most cohesive appearance possible. A custom in-ground pool or spa will transform any back yard into a deluxe gathering space, perfect for unwinding in peace or entertaining family and friends. The Clearwater team is renowned for our ability to design and install pools and spas that are perfectly orchestrated as integral parts of your outdoor-living space’s overall design. Plus, with endless options for sizes, shapes, configurations, decking materials, and accents like custom waterfalls and jump rocks, your custom pool and spa will be completely unique to you. Whether you’d like a classic precast fountain nestled in your landscaping or a large custom fountain as a focal point of your outdoor-living space, Clearwater will make it a reality. We have a huge selection of standard fountains in an array of styles and configurations, but the sky’s the limit. Our designers and tradesmen can work together to create a fountain that’s completely unique. We specialize in custom fountains with sheet effects, as well as integrating fountains with ponds, pools, and hardscapes. There’s nothing like the natural beauty of a pond to anchor your landscaping and enhance your outdoor-living spaces. Plus, when paired with the right combination of aquatic plants, fish, and circulation equipment, they can become their own unique self-contained ecosystem right in your back yard. 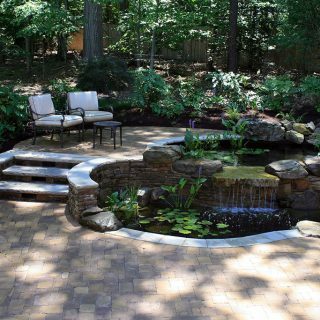 Our design and horticulture experts are highly skilled in using custom ponds to accentuate your landscape, and we’ll recommend the perfect plants to tie everything together. The result will be a pond that’s natural-looking and harmonious with your outdoor space, providing years of effortless performance and beauty. Custom waterfalls from Clearwater are a striking addition to any landscape. Our waterfalls combine the organic beauty of flowing water with a tranquil soundscape that enhances your relaxation and your enjoyment of your outdoor space. 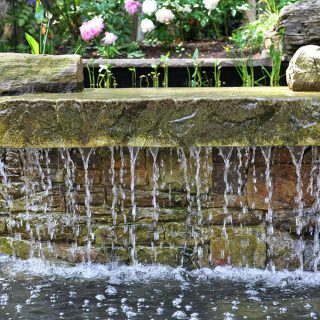 We’ve designed and built waterfalls of all types and sizes, ranging from simple cascades into a pool or pond to large watercourses spanning the length of a landscape. Whatever you can envision for your custom waterfall, our designers and installers will bring it to a stunning, high-quality reality. Over the past three decades, the Clearwater team has designed and installed a broad range of custom pools, spas, ponds, waterfalls, fountains, and more. Click below to explore our pool and water feature gallery to learn more about our experience.